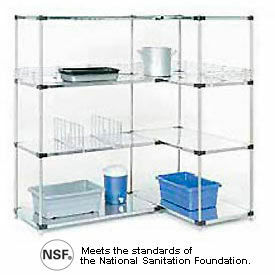 Solid galvanized steel, NSF Certified shelves are made with 18 gauge steel and feature raised edges for retaining small items or instruments that can fall through wire shelves. Quality galvanized steel with a clear epoxy coated finish resists moisture and corrosion and withstands extreme temperatures. Includes Globals Poly-Z-Brite finished upright posts to ensure dry storage & corrosion resistant use. 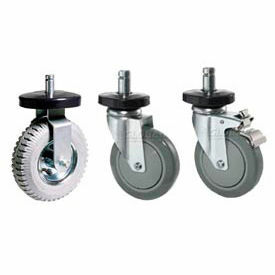 All parts include a 10 Year Limited Warranty against corrosion. Galvanized steel shelves easily adjust without tools and align accurately at 1" increments on numbered posts. Easy assembly. 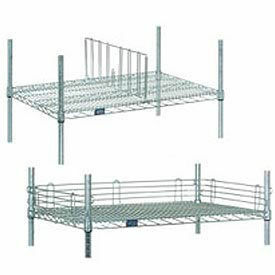 Starter Unit includes 4 posts with leveling feet, 4 shelves and plastic snap on sleeves to secure shelves to posts. Add-On Unit includes 2 posts with leveling feet, 4 shelves, plastic snap on sleeves and 8 joining clamps. 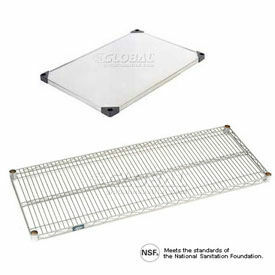 Individual Shelves are made of 18 gauge steel and include plastic snap on sleeves.